It’s exactly the way the Canadian Fed Cup team would have drawn it up – two wins on the opening day of the 2019 World Group II first round in the Netherlands, making for an auspicious debut for rookie captain Heidi El Tabakh. 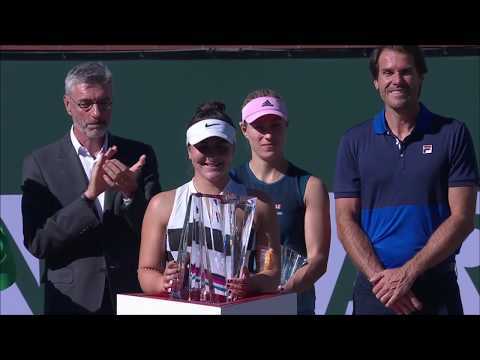 Bianca Andreescu is the heart and soul of the team and she played her role perfectly in a dominant 66-minute opening-match 6-4, 6-1 win over Richel Hogenkamp. Saturday’s second match at the Maaspoort arena in Den Bosch was a more complicated, drawn-out affair as Francoise Abanda continued her fine run of Fed Cup form – downing the No. 1 on the Dutch team, Arantxa Rus, 7-6(8), 4-6, 6-4 in two hours and 37 minutes. The 22-year-old from Montreal escaped from a perilous first-set tiebreak – saving one set point and then finally converting on her fourth – and then lost the second set but regrouped well for the third, breaking serve to 4-2 and eventually, at 5-4, serving out the match to love. That ultimate game followed the disappointment of failing to convert triple match point on the Rus serve in the previous game. The match featured a recurring pattern of straight up-and-down the middle exchanges as the players fenced with each while waiting for an opening or an error. The left-handed Rus spent a lot of time hitting high topspin shots while Abanda replied with low, flat drives that skimmed the net but almost never ended up in it. It was not the cleanest match as Abanda had 52 unforced errors to 37 for Rus. But the Canadian also pressured 43 (forced) errors out of her opponent while Rus could manage only 23 on Abanda. The closeness of the match can be seen in the final points total – 89-88 for Abanda. Post-match there was controversy about a line call when Rus had her lone set point leading 7-6 in the opening-set tiebreak. Abanda appeared to have hit long but umpire Marta Mrozinska came out onto the court and checked the mark (shown above) and ruled that the ball caught a bit of the line. Four points later Abanda won the set when Rus missed wildly with a backhand. Dutch captain Paul Haarhuis claimed that local television coverage was able to show that Mrozinska had looked at the wrong mark – although in the picture above there don’t seem to be any real alternative marks in the general area. While the second match overflowed with drama, the first one between Andreescu and Hogenkamp was really only close until Andreescu broke serve to 4-2 in the opening set. She soon went up 5-2 but then had a bit of a let-up as Hogenkamp rallied to 4-5. In the following game the 26-year-old Dutchwoman was serving and led 15-love. But she lost the next point when Andreescu pressed at the net and Hogenkamp missed with a lob that hit the ceiling of the Maaspoort arena. Soon Andreescu had her third set point and hit a cool forehand inside/in winner to wrap things up. The second set got away from Hogenkamp quickly as Andreescu broke serve in game two and quickly went ahead 3-0. Hogenkamp had said on Friday that she thought Andreescu was a better player now after her results of January (final of Auckland WTA event, qualifying and first Grand Slam event match win at the Australian Open and first WTA title in Newport Beach, California – all leading to her current No. 70 ranking) than she had been when they spilt two matches in 2018. Andreescu 2.0 proved to be simply too good, whether it was on clay or any other surface. Haarhuis’ viewpoint on Andresscu-Hogenkamp was as follows: “Andreescu was the player who had the most initiative. She was in charge continuously looking for that spot to be in the driver’s seat. If she wasn’t in a position to control the rally, she was in a position to put the ball back deep and start all over again. As for Haarhuis, trailing 0-2 it appears that desperate times call for desperate measures. Speaking with Dutch reporters after his team lost both matches of the best-of-five match tie, he said that he will tell Rus to hit out, play aggressively and completely go for her shots in a effort to beat Andreescu to the punch when they play the third match of the tie at noon (6 a.m. ET in Canada) on Sunday. He’s fully aware of the explosive game of the precocious 18-year-old from Mississauga, Ont., and hopes that Rus, essentially a defensive clay-courter, can somehow find it in herself to fight Andreescu’s firepower with firepower of her own. If somehow she does that successfully, then it will be Hogenkamp verus Abanda in the fourth match and then a possible fifth doubles match featuring Gabriela Dabrowski and Andreescu for Canada and Demi Schuurs and Bibiane Schoofs (with changes possible) for the Dutch. But if things do go Canada’s way and Andreescu wins to give captain El Tabakh another “perfect day,” then it will be on to the World Group I Playoffs the weekend of April 20-21 against an opponent, and at a location, to be determined by a draw at International Tennis Federation headquarters in London on February 12.